The owl magician have more than one trick up his sleeve! He hides under his wings a mirror in which baby can admire himself/herself. Wearing a polka dot wizard hat, the velvet star is a squeaking rattle to entertain your child. 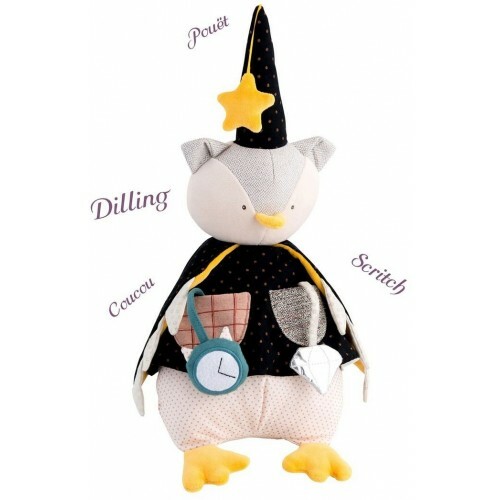 In his pockets, baby will find a little clock soft toy and a diamond with crinkly paper. Plus, he makes a rattle sound. A complete activity and sensory toy for your little one. Dimensions: 41 cm. In cotton and polyester. Suitable from birth.